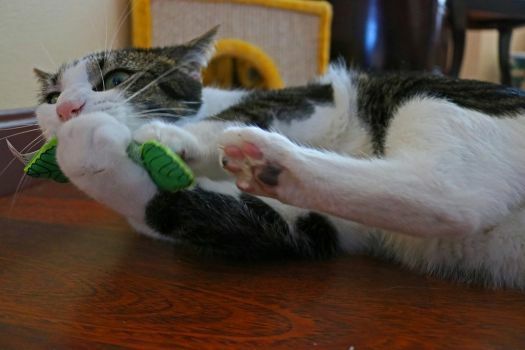 When you put catnip in a toy for your cats, or if you place some on the floor, or if you keep a fresh catnip plant near the window, your cats are going to go nuts for it. Your cats may exhibit several behaviors that are similar to how female cats react when they’re in heat. Your cats may sniff at it for a few minutes, rub their cheeks against corners, groom themselves, roll their bodies over it, or eat it. Not all cats respond to catnip the same way. Some will back away from it, and some cats appear unaffected by it. So let’s look at some facts about how catnip does (or doesn’t) affect our cats. 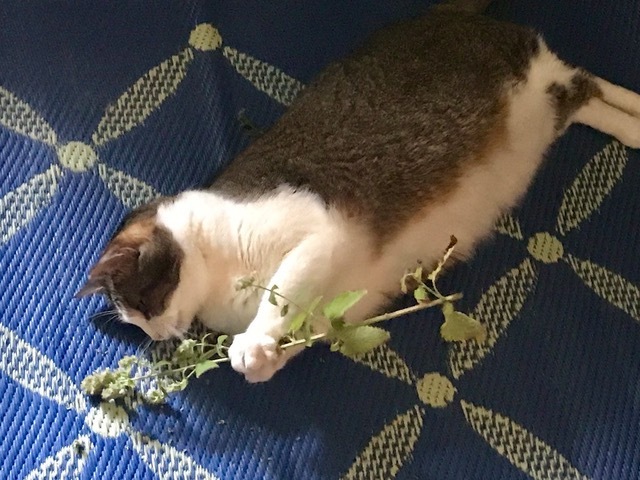 This little lady is loving a whole stem of catnip! Originally called Nepeta Cataria, catnip is a perennial herb from the mint family. It is also related to other herbs like oregano, basil, and spearmint. 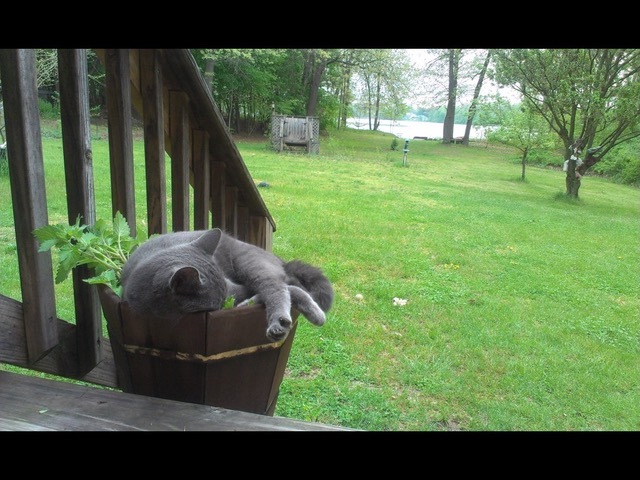 The plant is indigenous to Europe and its effect on cats have been known and recorded since the 1700s. Due to it’s popularity, it now grows all over North America. Although it is widely known as a weed, there are roughly 250 species in the plant family that are popular in herb gardens. The oil Nepetalactone is an active ingredient that is found in the leaves of catnip. Humans can’t smell this oil, but it has a special scent to domestic cats and even to wild cats such as leopards, lions, and tigers. The plant also has other ingredients such as tannins, acids, and sterols which cause cats to get high from the oil Nepetalactone. This oil binds receptors inside a cat’s nose and this stimulates sensory neurons leading into cat’s brain. Thankfully, it isn’t addictive and it is completely harmless to cats. 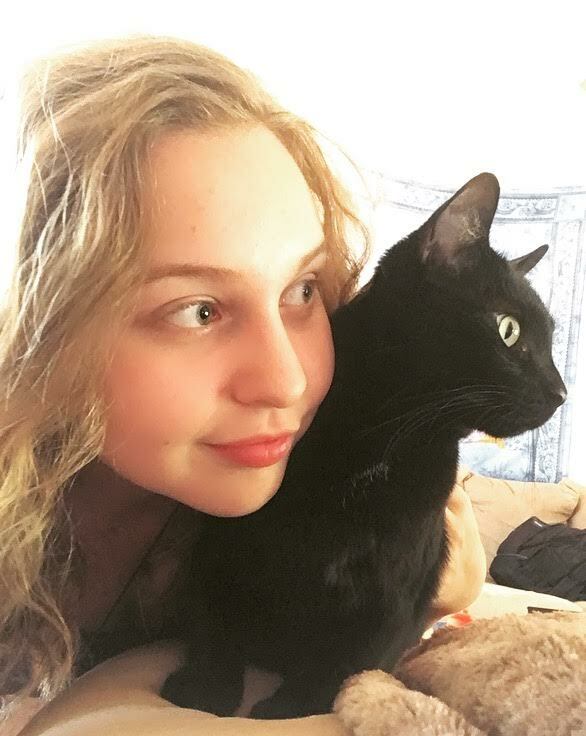 Nepetalactone is a stimulant, and when your cat sniffs catnip leaves or dried catnip, your cat gets high in a way that is similar to when humans take drugs. This effect usually lasts for about ten minutes. The plant also acts as a sedative as its initial effects wear off. 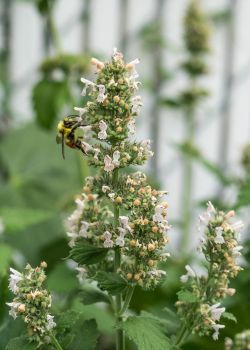 A bee feeding on a catnip plant. What determines whether a cat will react to catnip is a genome which is inherited, or not inherited, at birth. When a kitten is three to four months of age (when they have become sexually mature) you will discover whether or not they react to catnip. As a cat ages, their reaction to catnip can change, which means they might have a very subtle reaction to catnip, or no reaction at all. Your cat’s reaction (or lack thereof) can also be caused by being exposed to catnip too often, therefore triggering the loss of your cat’s ability to sense it. It’s recommended that you only give your cat catnip as a treat up to once a week. This means that you probably shouldn’t leave toys filled with catnip hanging around the house where your cats will have constant access. 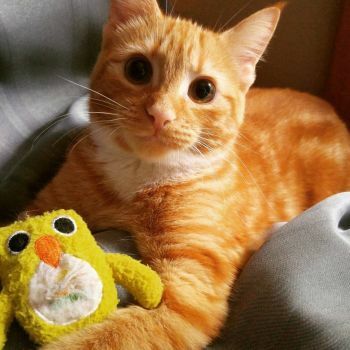 Loving his catnip filled birdie! When male cats are exposed to catnip, some become a bit too frisky and can even become aggressive with their owner or with other cats. This can create a pretty dramatic scene if you have multiple cats in your home and one happens to take on the persona of The Hulk. Keep in mind that this doesn’t always happen. Some cats drool, others become very playful, some get frisky, some get aggressive, others become extremely vocal, and some will just enjoy their experience. If you plan on give catnip to multiple cats, give it to them individually in separate rooms to avoid any issues. Have you ever heard of positive and negative reinforcement? If not, don’t worry about it (unless you work in the health and social services fields). Psychologists determined that negative reinforcement towards children and pets such as spanking, yelling, using terms like, “You’re being bad” is more damaging to the behavioral health of pets and children. It is better to offer to your children and pets positive reinforcements, and this is done by praising good behavior by giving gifts or treats. If you have an aggressive cat in your multiple cat home, you can modify their behavior by providing them with catnip as a means of calming them. If you have a cat that is fearful, timid, or has experienced trauma, you can treat them with catnip as well. This can also be used to enforce personal playtime between you and your cat. The common name for the the plant is “catmint” and it can be grown easily and in potted plants or a backyard. The plant can become up to three feet tall and three feet wide. Their rather small, white colored flowers grow in clusters on the plants and the stems have a squarish shape which naturally belong to the mint family. The plant needs sun and they are very drought-tolerant so if you live in the desert you can grow these plants without struggling. To start growing catnip, plant them in partial shade to and make sure to use alkaline soil in your potting plant or garden. If you are growing catnip in your home, try to keep it in a hanging basket from a ceiling hook so your cats can’t access it. If you’re growing the catnip in your garden, fence off this area of your garden so wild cats won’t be tempted to come and raid your garden. It is recommended that you pinch the stems of the plant while it’s growing to loosen the plant stem. When you begin harvesting, the plant must be flowering and dry. Cut off the whole plant at the base and hang it upside down in a dark, dry, well-ventilated place such as a pantry or an attic. Afterwards, store the dried leaves, stems, and flowers in a freezer bag to preserve the potency of the oil within the plant. This kitty found the catnip plant outside! Catnip can be brewed to produce an herbal tea for human consumption. It is also used as a culinary herb for some dishes. It can be smoked, and it only has the effect of relaxation like other herbal cigarettes (otherwise known as tobacco-free cigarettes) such as corn silk, lemongrass, mint, cinnamon, and rose petals. Don’t Want To Grow Catnip? Try Catnip Spray! If you don’t want to deal with growing your own catnip plants, you can always purchase it at your local pet store, or purchase catnip spray. Catnip spray is made with concentrated catnip oil. The oil is steam-distilled from the catnip plant to produce very potent catnip oil. You can spray it on your cat’s toys, scratchers, cat condos, or their cat tree. KONG and Field Organic Catnip Spray are two of the best brands around. Regardless for the reasons why you decided to use catnip or where you get it from, your cats will surely love you for it. Whether you give catnip toys to your new kitten, keep a small plant in your kitchen window, or provide your elderly cat with catnip to keep them comfortable, they will be very excited. Enjoy watching your cat roll around in bliss, and maybe can enjoy some catnip tea with them!